This article guides you in how to print out your iPhone messages. Check out our Droid Transfer page if you need to print Android messages instead. 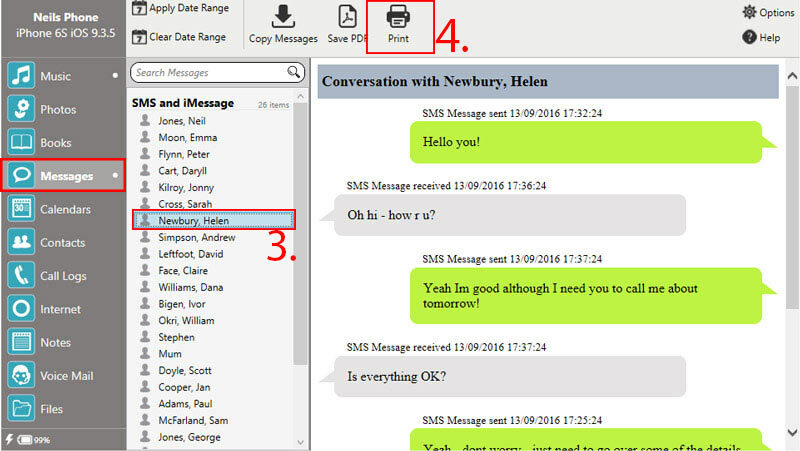 Step 3: On the "Messages" tab, select the messages you'd like to print. Step 4: Press "Print" and your standard print settings will appear. Once happy, press "Print". Which messages can I print? How to Print Text Messages from iPhone - You can directly print out any of your SMS, MMS, iMessage or WhatsApp messages from within TouchCopy by simply selecting the desired message, and then clicking the "Print" button in the TouchCopy control bar. From here your standard print settings page will open for you to print the required message. TouchCopy will print your message in the same format that they are displayed on your iOS device. TouchCopy displays a list of contacts with whom you've had text message conversations. Clicking on the contact in the list shows the text (SMS), multimedia (MMS) and iMessages sent and received in that conversation. You can also search your contact list by name to display all messages by a particular contact. Your WhatsApp messaging contacts and conversations are displayed under the "WhatsApp" header in your SMS contact list. Using this filter, you can select only certain messages to print, rather than printing the entire conversation thread! Cleverly, TouchCopy even treats and organizes group messages, so they retain their format. Your group messages are displayed and copied by TouchCopy as they are displayed on your iPhone.